Set alongside the River Misbourne, this ancient inn is reputed to date back - in parts - to the 14th century. Something which undoubtedly makes it one of the oldest places offering accommodation in South East England. Whatever the truth about its age, these days The Greyhound Inn is far more ‘boutique’ and ‘gastropub’ than austere overnight lodgings for medieval travellers along the old London road. And for that we ought to be grateful. As befits a place of such age, a fair few notable figures from history have passed through its door. Among these are Sir Winston Churchill, Oliver Cromwell, and the 17th century’s most notorious and viscerally loathed legal figure Judge Jeffreys. In fact, it is said that his “victims” were hanged from gallows erected by the river. 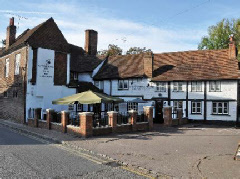 Offering 12 guest rooms in all, the Grade-II listed Greyhound is within easy reach of Watford, Gerrards Cross, Uxbridge, Beaconsfield and High Wycombe. The M25 London Orbital and the M40 are both just a few miles away. Reviews and Booking. Please note that nightsinthepast.com plays no part in the actual review, booking or reservation process for The Greyhound Inn or any other accommodation. Costs for maintaining and developing Nights in the Past are met solely by it being the last referring site to our partners which results in a completed reservation.